^ a b c d Lewis, James (1989). 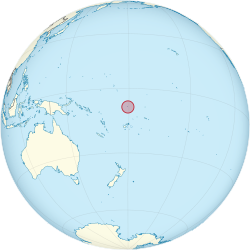 “Sea Level Rise: Some Implication for Tuvalu”. The Environmentalist 9: 269–275. doi:10.1007/BF02241827. ^ Yamano, Hiroya; Hajime Kayanne, Toru Yamaguchi, et al. (2007). “Atoll Island Vulnerability to Flooding and Inundation Revealed by Historical Reconstruction: Fongafale Islet, Funafuti Atoll, Tuvalu”. Global and Planetary Change 57: 407–416. doi:10.1016/j.gloplacha.2007.02.007. ^ Jackson, Peter (2007). “From Stockholm to Kyoto: A Brief History of Climate Change”. UN Chronicle XLIV (2). オリジナルの2012年1月19日時点によるアーカイブ。. https://web.archive.org/web/20120119205203/http://www.un.org/wcm/content/site/chronicle/cache/bypass/lang/en/home/archive/issues2007/pid/4819 2010年1月18日閲覧。. ^ Patel, Samir S. (2006-04-06). “News Feature — Climate Science: A Sinking Feeling”. Nature 440: 734–736. doi:10.1038/440734a. ^ Aung, Than; Awnesh Singh, Uma Prasad (2009). “Sea Level Threat in Tuvalu”. Americal Journal of Applied Science 6: 1169–1174. ^ SPSLCMP (2007年12月). “Pacific Country Report on Sea Level & Climate: Their Present State — Tuvalu (PDF)”. The Bureau of Meteorology, Australia. pp. p.14. 2010年1月12日閲覧。 Zervas, Chris (2001-07). “Sea Level Variations of the United States 1854–1999” (PDF). NOAA Technical Report: NOS CO-OPS 36. http://tidesandcurrents.noaa.gov/publications/techrpt36doc.pdf.